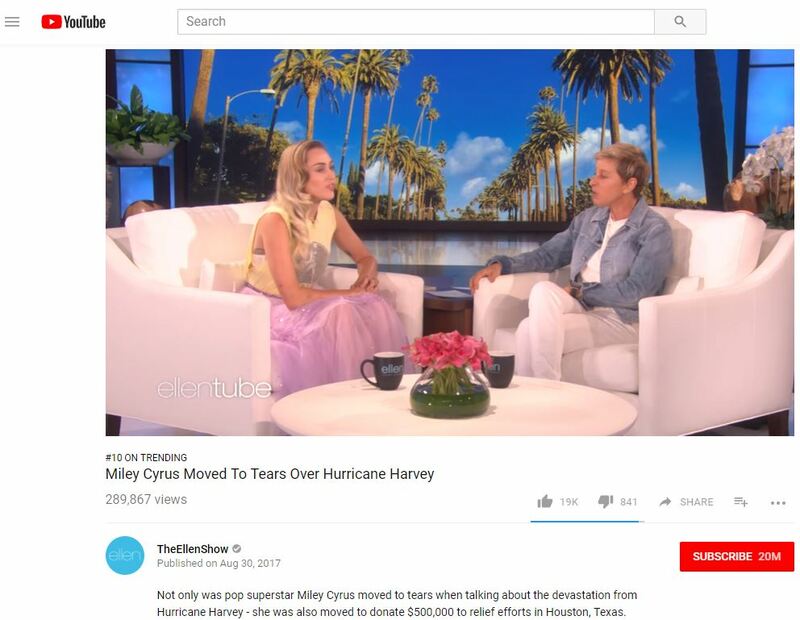 Recently Miley Cyrus appeared on Ellen’s show to announce her $500k donation. This video was posted on August 30. Today, this video peaked at #10 on YouTube Trending. Miley Cyrus wore a sleeveless Elvis Presley shirt with a glittery purple skirt. Ellen praised Cyrus’s gesture of generosity after announcing her $500,000 donation. Cyrus began to cry while announcing that she would donate this money to Hurricane Harvey relief efforts. Moved, Cyrus expressed the importance of acting with kindness and understanding. “I’m really happy to help in any way that I can and I hope that people understand and can put themselves in those people’s shoes and just know what it feels like to have everything taken away from you,” Cyrus stated. Miley Cyrus is donating $500,000 through the Happy Hippie Foundation. She joins Beyoncé, Leonardo DiCaprio, and Sandra Bullock in the list of celebrities who have donated to Hurricane Harvey relief efforts. Also, Google announced that they raised $2 million towards helping the victims. Click here to make a donation.